Using guns as a marketing bonus has a long history in the United States. A free firearm with a car or to open a bank account has been fairly common in the last few years. The usual system, in our over-regulated age, is to give a coupon to be redeemed at a gun shop, which has made a deal with the car dealership or the bank. 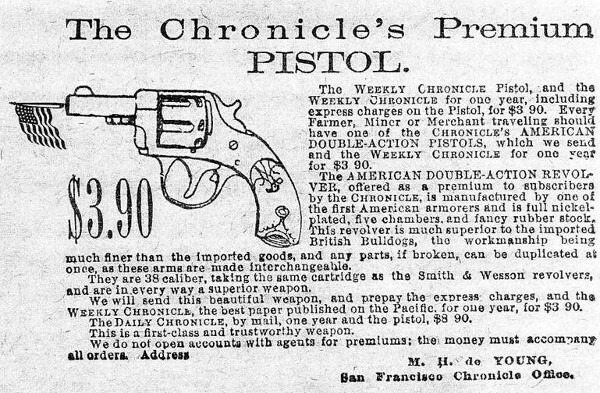 But things were simpler in 1887, when the San Francisco Chronicle offered a pistol along with a year’s subscription, for $3.90. That did not include mailing the paper. If you lived where the paper was delivered, you could pay the delivery charges separately. To have the paper mailed was another $5 a year, or about 10 cents a week. When you use constant dollars to correct for inflation, $3.90 in 1887 would be $96 today. If you use gold as as the standard, $3.90 bought you .195 ounces of the stuff in 1887, or $253 at today’s price of about $1300 an ounce. That’s still cheap for an inexpensive pistol and a year of weekly newspapers in a major city. 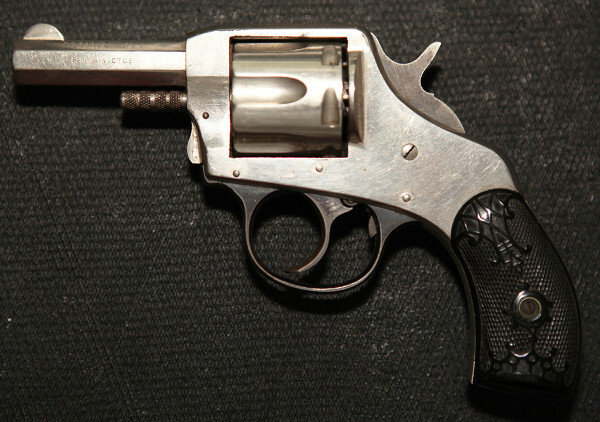 The .38 S&W H&R American Double Action revolver advertised has a solid frame. It was stronger than many of the top-break designs in common usage at the time. It’s a pull-pin design. To load it, pull the cylinder pin and remove the cylinder. Fill the chambers with cartridges, then replace the cylinder and the cylinder pin. Here’s a picture of one in decent condition, chambered in .32 S&W long. It is a simple, solid, design. Old ones often have spring breakage, but parts can be found, and a gunsmith can make a replacement spring. What they can’t replace: the Chronicle’s open acceptance of guns and, by extension, gun rights. The paper is now irredeemably anti-gun. How times have changed. Cool…back when demonrats didn’t mostly all want you disarmed? Back when The Flag was positively associated with guns, and no one worried about where San Francisco might stick it next. That offer would be illegal today. The editor would be sent to the gallows. I went to an inflation calculator and it had 3.90 in 1887 at about 104.00 now. I would pay 104 for that exact gun now and forego the subscription. Back before government started the serious business of governmenting. I think I used to have a gun like that. I was about ten to twelve. My dad gave it to me after filing off the firing pin on the hammer. I wish I could tell you what happened to that pistol but I can’t/ It probably got tossed out. BTW, this would have been around 1962-1964. That story really made me smile, Thank you for that. Then it really made me sad… Not your fault. San Francisco has really changed………. A long long time ago in a city far far back in time, the Barbary Coast did believe in sexual and gun freedom at the same time. Now they have given up their guns to keep their sexual freedom. They have changed the definition of the word freedom. Only socially and morally healthy societies can allow the unfettered possession of firearms. The gun control laws in modern social(ist) “democracies” (including our own) stand as living proof that social democratic welfare state produces weak, dependent and morally corrupted individuals. We need a revolution! The first statement, “Only socially and morally healthy societies can allow the unfettered possession of firearms”, is undeniably true. But he rest is not necessarily so; it is also true that a “socially and morally healthy society” might well not need firearms. The symptom that indicates that a society is not “socially and morally healthy” is dependence on government for the personal protection that is plainly needed from the behavior of a significant portion of members of that society.